Meet: Friedrich Engels Statue outside HOME, 2pm. The Luddites burnt down the first cotton mills in Manchester, but some of the darkest, if not most Satanic, mills remain around Oxford Road station. 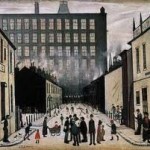 This is the story of how Manchester grew rich from the cool cosmopolitan cloth.